Another pumpkin recipe? Yep, it's fall and I'm surrounded with pumpkins and pumpkin dishes everywhere I look. 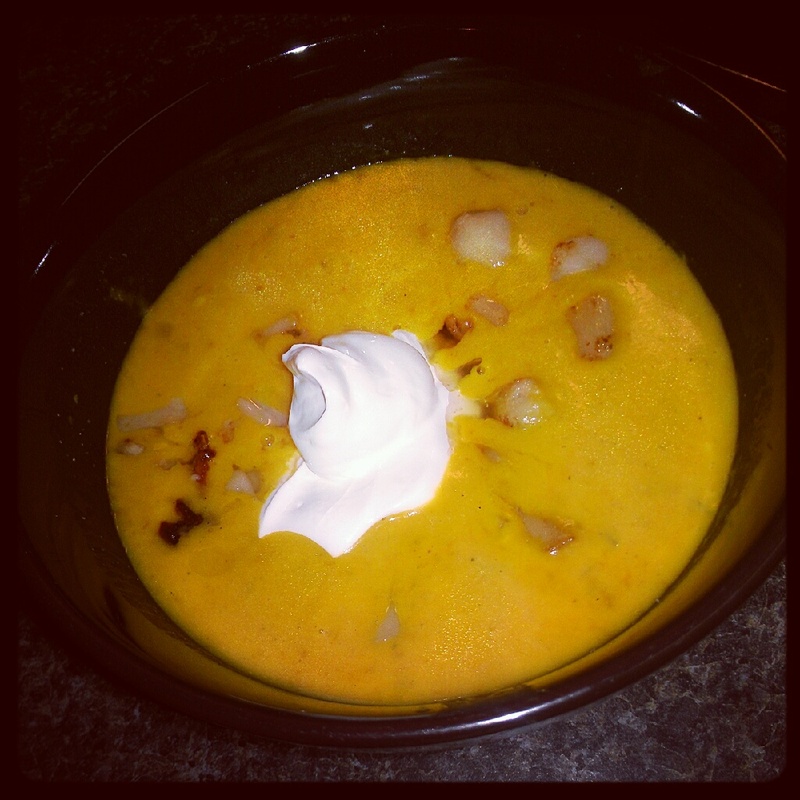 Good thing pumpkin is definitely a healthy dish and it's very versatile. This take on pumpkin is a mix between sweet and savory, but it's a good combination. You have the semi-sweet taste of cooked pumpkin with the highlights of coriander and curry mixed with the saltiness of the scallops and the tang of sour cream. If you're not too keen on the curry, there's no harm in taking it out and upping the salt and pepper for a different taste. Heat the coconut oil in a medium saucepan. Add the onion and saute until the edges turn translucent. Add the garlic and ginger and saute for 2-3 more minutes. Add the dry spices except for the salt to the pan and cook an additional minute or two until the spices turn fragrant. Add the pumpkin and coconut milk and slowly stir until thoroughly combined. Add salt. Continue to heat the soup and simmer for 15-20 minutes. Using a food processor or immersion blender, blend the soup (in small batches if necessary) until the mixture is an even puree consistency. Heat the remaining coconut oil or ghee in a sauce pan. Salt scallops. When the oil is very hot, add the scallops to pan and leave to sear 2-3 minutes. When the side looks lightly browned, flip the scallops and repeat. Try to leave the scallops alone while they are cooking so that a nice crust will develop. Prepare bowl of soup and top with scallops. Serve with a topping of sour cream or Greek yogurt if desired. Use an AIP-friendly curry powder (seeded or seedless recipes can be found here) and skip the red pepper flakes and coriander (if going seedless). Skip the sour cream/yogurt garnish.